Content provided by Jamco Unlimited, Inc. Most homeowners opt for custom cabinets during their kitchen remodel. With most custom cabinets, you will have the option of many integrated storage features. These integrated options help you have a place for everything and be able to find it when you need it, all while limiting kitchen clutter. Custom cabinets have come a long way in the past few years. No longer are you just talking about the face design and finish, but now options for inside are plentiful. When you open your current cabinets, what do you dislike about them? Likely, it’s accessibility of the shelf space. Perhaps the most popular custom cabinet option is adding pull out shelves to bottom cabinets. Larder and pantry cabinets are growing in popularity as well. Many homeowners request the larder cabinets for spices and baking supplies. If your home lacks space for a traditional walk in pantry, a pantry cabinet can help you store your food items in an organized and accessible manner. Trash and recycling are changing too. You can have tilt out bins, swing bins, and traditional pull outs. Whatever your needs and preference are, you can likely find a cabinet that will suit you and your space. Today’s kitchens have many more drawers than cabinets. 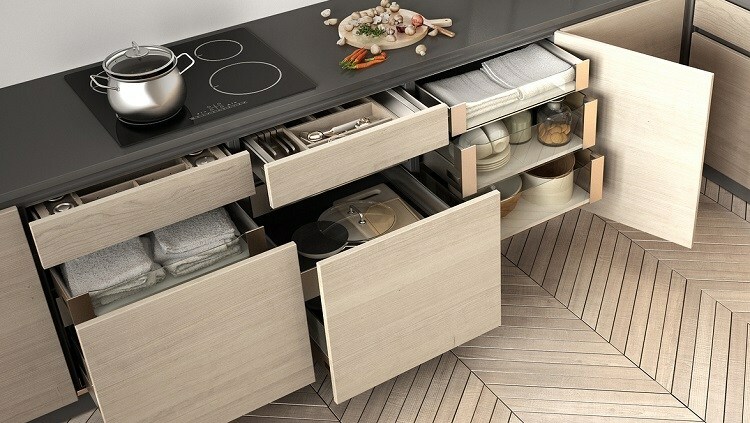 This is largely due to the fact that integrated drawer storage is a popular feature for any kitchen renovation. Consider outfitting your drawers with with pot and pan storage, pull out bins, dish storage, knife blocks, and silverware dividers to name a few. The main benefit of integrated storage is the ability for everything to have a place. Integrated storage of all types helps reduce clutter but especially that in drawers. One of the easiest integrated storage options today is for hidden appliances. If you don’t want your dishwasher or refrigerator to appear like appliances, choose one that can accept a cabinet face. Microwave drawers and small appliance storage docks are another popular way to give everything a place in your kitchen. If you want an organized kitchen that looks great, let Jamco Unlimited help you select the right options for your kitchen. Since 1995 we’ve been helping families turn their kitchen into their dream kitchen. Call today to schedule a no obligation consultation in your home – 727-412-8524.